The Cuban archipelago was a strategic location for the pirate action. However, not only Cuba was victim of the vandalism of those foreigners that used to plunder the wealth of this young Spanish colony. This land also had its own killers. 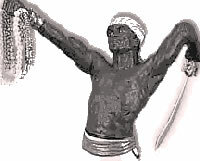 Diego Grillo was the first pirate to be born in this island who was very well known worldwide. He was born as the result of a romance between a Spanish conqueror and an African slave towards the year 1555. When he was only 13 years, he run away and joined a group pf Spanish buccaneers that had dealings for these lands. He grew up in the area of the Mexican Gulf and the Caribbean Sea. After four years in which he acquired great sea skills, he was captured by the frightful pirate Francis Drake. This experienced old salt soon realized that the young Diego Grillo had a pirate talent and he preferred to keep him with him and took him to England. Being only 22 years, he became the favorite in the royal court and even the same king and queen honored him for the contributions to their interests. After a five-year period in the English land, he returned to the Caribbean lands as the second one under the command of Drake and very soon, he took the lead of the mission. When his protector died, he returned to the kingdom full of gold and fame. Later, after being far from his misdeeds, he reappeared in the Antilles, but in this opportunity together with the renowned group "Pata de Palo" (stick leg) who was a reckless pirate whose real name was Cornelio Jois. This was considered one of the bloodiest unions in the piracy history. Some many Spanish ships felt their strength; they took almost the whole crewmembers prisoners. One of their most meritorious commands was an expedition formed by 11 ships with Spanish flags. He had enough to enjoy the rest of his life living in great luxury but he wanted to give a final thrust in Nuevitas bay, in Camaguey province. The ships loaded with abundant treasures departed from that port to Spain. In 1619 after a highly organization of the action, Grillo surprised a caravan of six frigates at the entrance of the aforementioned place. It was such a plunder that Diego Grillo was disappeared form many years, but in that opportunity he does really enjoyed in the English bars the countless fortune obtained by the first Cuban pirate.